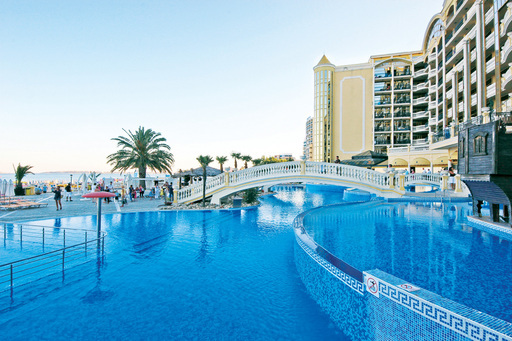 This popular hotel and apartments in Victoria Palace is an perfect location in the resort of Sunny Beach, it has direct access to the gorgeous golden sandy beach, the promenade and also the main resort (Sunny Beach). With its impressive design and wide range of spa and leisure facilities, you will be stunned at what the Victoria Palace has to offer you during your holiday to Bulgaria. The Victoria Residence apartments are located just a few metres behind the hotel meaning the amenities for guests of the apartments are just a few steps away. (Local charges may apply for the use of facilities). There are no more properties being built this close to the seafront/promenade. Shop, Billiard room, Internet room, Exchange desk. Victoria Residence complex consists of 2 buildings A and B. In the two 5 storey buildings there are 80 apartments and 24 shops on the ground floor. There are 73 one-bedroom apartments, 2 two-bedroom apartments and 5 studio apartments. The distance to the beach is 50 m.